Regain system intent on making offense a means of defense as well. The official Japanese website for Bloodborne has seen a massive overhaul, bringing with it new information about From Software’s upcoming PlayStation 4 title. Of particular note are details regarding the game’s Regain system and some of the characters that players will encounter, as well as additional material on some of the game’s weapons and areas. Sometimes the best defense happens to be a good offense. In the event that you manage to get hit by an enemy attack and take damage, if you manage to strike back within a limited time window, you can get a morsel of your lost health back. This new Regain system introduces a strategic twist to defense that makes fighting to the death an ever-tempting proposition. Saw: The Saw is one of the Hunters’ iconic weapons. Boasting transformitive capabilities, it can either function as a standard saw that’s good for hacking away at beasts or can switch into a longer-handled form where centrifugal force is used to a deadly advantage. Hunter’s Axe: This curve-handled weapon is another of the Hunters’ emblematic tools of the trade. The ability to extend its handle out allows the Hunters to be able to respond to situation changes on the fly while still retaining the Axe’s primary functions. Although it’s heavier than the Saw, it’s also better for getting health back through the Regain system. Some Hunters make the axe their weapon of choice because it allows them to act as an executioner, even if their targets are already no longer human. Hunter’s Rifle: A common gun to find among Hunters, the rifle fires out scatter shots. Often used as a means of dealing with swift-moving beasts, its scatter bullets make it highly effective at hitting targets with ease. Cathedral District: Separated from the rest of Yharnam by hills, the Cathedral District is home to a medical organization that presides over the city’s unique “Blood Treatments.” As the name implies, it also has an old cathedral that still stands tall and proud in these tough times. Hemwick Cemetery District: As one would expect for a place like Yharnam, the city has a large allocation of land dedicated to its graveyard. With large and small graves alike lined up haphazardly, the Cemetery District is an ominous and gloomy place. Compared to the main city proper, it’s one of the poorer areas to be visited, as well as less cultured all around. Few people wander around here today, leaving one to wonder just what exactly is lurking around there. Hunter Gascoigne: Gascoigne is a blood-soaked hunter who stands alone in a part of the graveyard where ashes flutter about. Aside from the fact that he fact that he’s veteran soldier, little else is known about him. Clergy Beast: Even by beast standards, the Clergy Beast is a conspicuously huge creature. Sporting hideous horns, it lets out shrieks that sound like cries of agony. Although its body looks so malnourished that its ribs poke out and its remaining muscles are thin strings that cling onto its bones, it’s in actuality an extremely strong fighter. Rumor has it that this beast above all others is the one that Yharnam’s clergy fear above all else, hence its name, although the truth of its human origins remains foggy. Hunting Horde: A mob of people ravaged by the disease, they fervently continue their hunting duties unaware of the transformation their own bodies are undergoing. Their eyes may very well see people as being beasts themselves…. Wheelchair Horde: Among the standard members of the Hunting Horde are a handful of elderly people confined to wheelchairs. Their sight is a common one in Yharnam in this day and age, particularly with respect to wealthy elderly people. Many of them cling desperately to their guns for self-defense, their memories of tragedy still vivid. For them, their guns are the only things they have to protect themselves from the beasts, as well as their one way of turning violent in general. Carrion Crows: The Carrion Crows are those who are content to eat meat off the corpses of humans. 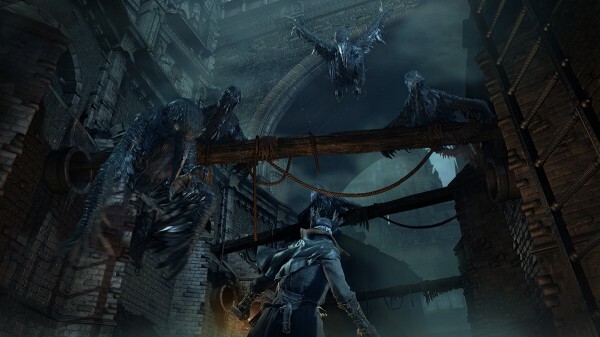 In Yharnam where dead bodies are plentiful, these crows get so fat from their meals that they become unable to fly. Nevertheless, their attacks aren’t to be taken lightly. Sensitive to the scent of blood, they’re known for attacking their fair share of people who get senselessly close to them, most likely because the flesh of the living can turn dead soon enough if they have their way.